An Easter balloon release at Faith Christian Church. It has occasionally struck me that Easter, though a major Christian holiday (maybe the major Christian holiday), seems to have relatively few church ceremonies associated with it compared with Christmas, which has many and varied. So here's something I thought would be wonderfully uplifting, simple, and even a reminder to the community at large that "He is risen!" 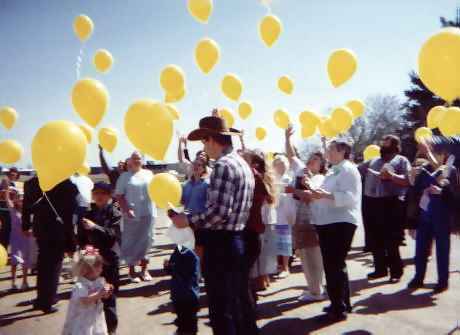 I think it would be really awesome to come out of church on Easter morning and be handed a yellow biodegradable balloon, then the pastor (or priest or minister or whomever) would say a brief, joyful Easter prayer and everybody would release their balloons - hundreds of them drifting upward! Looking across the skyline throughout the morning you could see which churches were getting out by the rising balloons. "There's First Presbyterian! There's Maple Street Assemblies of God!" Then maybe a little later, "There's St. Jude's Catholic Church, and over there I see Victory Chapel!" On Easter Jesus Christ arose, and the rising balloons symbolize his rising. Later he ascended, and the rising balloons make us think of that as well. I thought yellow would be wonderful to symbolize Easter morning - the beauty of the rising sun. It would be an awesome sight, and would remind us of our awesome God. It would raise our eyes to the physical heavens and make us think of the spiritual heaven. If your church wants to do this, give your city hall (or county or whatever you have) a quick call to make sure there's no problem with doing this in your area.